Michael McFadyen's Scuba Diving - Stoney Creek Almost 10 kilometres wide (east to west) and just over 15 kilometres north to south, Jervis Bay is the largest bay on the NSW coastline. With a mouth five kilometres across, the northern headland of Point Perpendicular has the most dramatic cliffs of any section of coast in NSW which Bowen Island (in reality the southern headland) is home to a large penguin colony. While the land to the immediate north, west and south is fairly low lying, the bay is protected from the open sea by Bowen Island and the enormous sandstone cliffs that rise up from the ocean. These dramatic cliffs give way to an even more dramatic undersea terrain which drop away to well over 50 metres, in some places only 50 metres off the shore. Located just over 180 kilometres south of Sydney by road, Jervis Bay is a piece of NSW that has been largely undisturbed by development. Like Sydney Harbour, a large section of the land surrounding Jervis Bay is under the control of the Australia military, in this case, the Royal Australian Navy. As strange as it may seem, this has led to the bay being protected from development. Despite having a naval bombardment range on one section of the bay and coast and being originally proposed for a nuclear power station, the bay is now almost totally protected from further development. The majority of land around the bay is now either part of the NSW Jervis Bay National Park, the Federally run Jervis Bay National Park (at least there used to be two, the Federal one has now changed its name yet again) or the navy base and bombardment range. 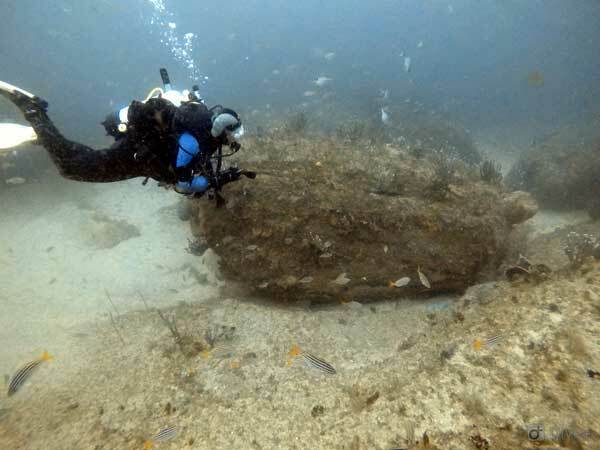 Being so close to Sydney, Jervis Bay is a very popular dive location, although most divers generally only get to see a very small bit of what Jervis Bay has to offer. This is because the dive charter operators generally cater to the lowest common denominator (that is, the most inexperienced diver on board) and even if you have an experienced, do not want to travel too far from the mouth of the bay. 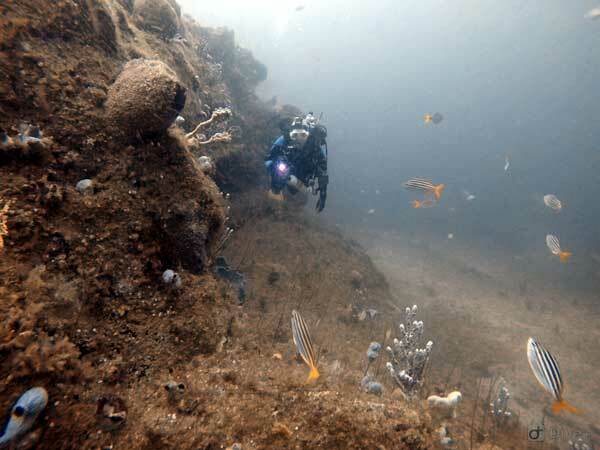 Probably the best dive site at Jervis Bay is Stoney Creek. Located four kilometres or so south of the southern end of Bowen Island. 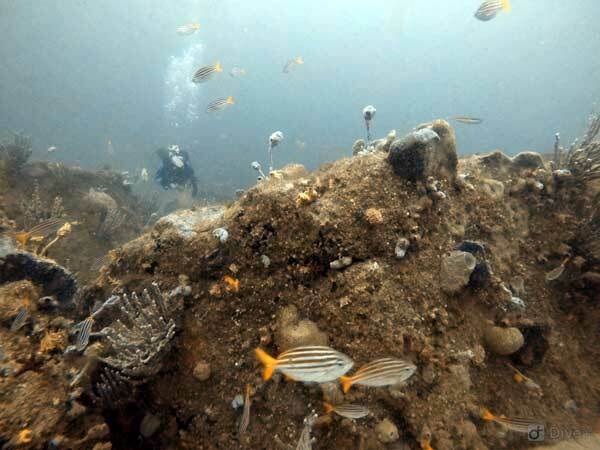 Unlike most Jervis Bay dive sites, the Stoney Creek dive site is quite a distance off the shore (perhaps 1.5 to 2 km). The dive site can be located using GPS readings of 35° 09.922'S and 150° 46.037'E (using WGS86 as datum - see my GPS Page for more info), the mark at left and your depth sounder (see following description). The reef top starts at 37 metres or so. If you are in the right spot, it will drop in one drop to over 50 metres. Elsewhere it drops to 40 metres. By using the GPS reading and running at right angles to the coast, you should easily pick up the reef. Anchor on the reef top if possible. Stoney Creek is nearly always subject to strong currents and more often than not, you will have to abandon a dive due to the strength of the current. After anchoring, carefully check the speed of the current before entering the water. When you reach the bottom at 37 metres you will see a flattish reef covered totally in sea whips, sponges, sea squirts and other colourful sealife. This is one of the most colourful dives you will ever do, far better than the colours to be seen on any coral reef. There is not a coral reef alive that can come anywhere near Stoney Creek for colours. The visibility on this dive is generally excellent, in excess of 25 metres (as one would expect with strong currents) and reaching 30 to 35 on many occasions. 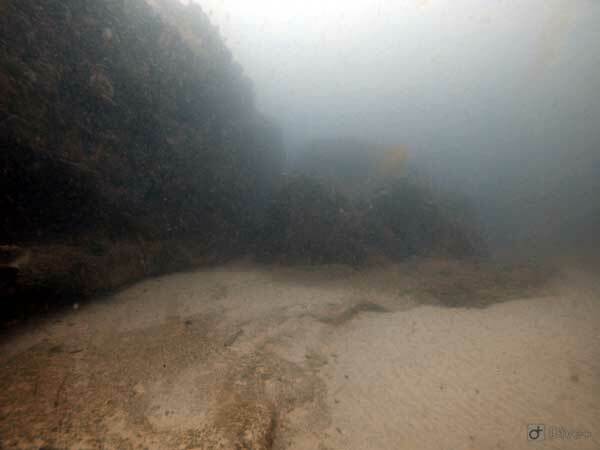 With visibility like this, you can see the bottom from high up the anchor line and before you reach the 37 metre mark you will be able to see the bottom of the wall at more than 50 metres. With a varied depth on this dive, you can either go down to 50 metres for a while, then back up to a bit of a small ledge at 45 metres before going to the reef top at 37 metres. If you do not want to go so deep, you can stay at the 37 or 42 to 45 metre level. With the excellent visibility you can see most of what is going on below you. We have also done this as a drift dive, entering at the mark above and drifting south. Towards the southern end you can come up (heading west) from 42 metres to a 38 metre flat area and then hit a wall that is about 34 metres on the top. This is a great dive site, as good as if not better, than any coral reef I have done. Excellent for the experienced diver.